I have always told my children that they don't necessarily have to wait until they are older to achieve their dreams. They can invent, make, design, compete and speak out whenever they feel they want to. 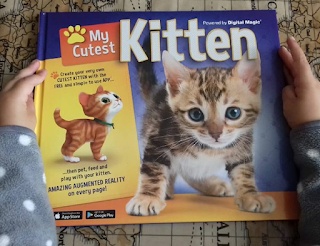 This book, Never Too Young, has come at just the right time. 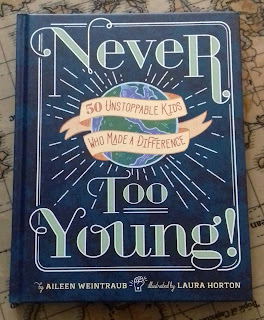 It contains 50 true stories of inspirational children from across the globe and it has been encouraging and inspiring my kiddies to stand up and achieve whatever they put their minds to. They have been reading all about the fascinating lives of these children including a seven year old surgeon, an eagle huntress and an Olympic Gold Medalist all of whom are around the same age. Inspiring the children of Bradford to write Poetry! It's National Poetry Day 4th October so I have been busy planning the next Home Education group meet up for Monday 10:30am at Manningham Library, Bradford which will be all about Poems and getting kiddies into Poetry. I have invited our local poet, Sheena Hussain from Allerton, Bradford, to come along and join in the fun! Sheena is the author of her debut poetry collection published as a result of her health adversity. Sheena, as a poet, is championing writing for wellbeing. She is the creative spark behind her new business Poetry by Sheena Poetry by Name which is a new poetry writing service that she offers. Sheena is using her new platform to engage with organisations by way of delivering workshops to inspire people to write poetry and connect with personal thought, which in turn will help their wellbeing. A few weeks ago we started our new Nature curriculum using this amazing book, Forest School Adventure by Naomi Walmsley and Dan Westall, packed with information, ideas and lovely colour photographs throughout. We have taken our classroom outdoors and into the garden, park and woods making bug hotels, 3D maps and leaf printing. The book is an excellent educational tool for all educators, and children who want to get up close to nature whilst learning how to make fires without matches, build shelters, cook on fires and how to forage. From essential basic bushcraft and survival skills to fun outdoor play this has been the best book I've added to our growing Home Ed library this year! It's broken down into four main sections covering Nature Awareness, Bushcraft, Wild food and Games. On 22nd September it's World Rhino Day! Do you have anything planned? I work for Bradford Libraries and run a weekly Home Education group so I am busy planning some activities for the group as well as for my own kiddies at home! We will be learning all about Rhinos through some non-fiction books I managed to find and reading some fun stories too! 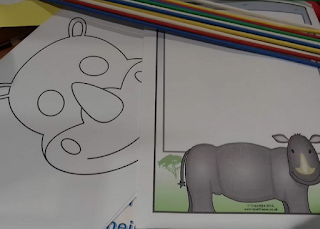 We will also be making Rhino masks and the older ones will be doing some writing exercises on paper with a Rhino-themed border! At home, we will be completing some Rhino challenges to gain our Rhino badges through the WWF Explore! Check out the free poster here and if you complete the activities then don't forget to order your badges here. You could also try making a recycled rhino hat here! What activities do you have planned to teach your children all about the five species of Rhino and how these critically endangered species desperately need our help? We don't have any pets which is probably just as well as it's hard enough looking after five children of different ages, two of which are growing out of their childhood asthma. I remember having many different pets growing up from mice and finches to rabbits, cats and hamsters. We always promised our parents we would look after each and every one, but at the weekend it was always my Dad cleaning out the rabbit hutch regretting their decision to give in and let us have one! If there's one pet which they would all love, it's a cat! They make do by leaving food and milk out for all the cats on our street who happily congregate in our front garden in the evening, and have even left us a mouse or two to show their appreciation! 10 things to do with conkers this Autumn! It's that time of the year again when the boys want to head to the park! Not to feed the greedy geese or play on the swings, but to collect pockets and pockets of conkers! So then what do we do with them all? I thought I would make a post of 10 things to do with conkers to give you all a few ideas other than the usual traditional game of 'conkers'. 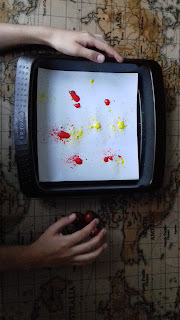 Place a piece of paper on a tray and add dots of paint. We used red and yellow knowing it would make a lovely Autumn orange colour. Add two or three conkers to the tray and start moving the tray around so they roll in the paint creating a lovely work of art! You could teach mixing primary colours this way to the younger ones too! 2) Make your own clay snails and pop a conker on its back as its shell! 3) Conker rolling! Have a conker rolling competition or even make it into a fun Maths lesson and measure the distance of your roll! 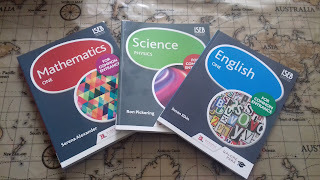 I have been using the Galore Park curriculum for a few years now, after looking into the different curricula on the market and the various workbooks on offer. The Galore Park books were exactly what I was looking for, as the chunky textbooks are very thorough with plenty of examples and questions to work through. I feel confident knowing the fact that whilst the kiddies are using the Galore Park curriculum, they are covering all key areas of learning, in each of their core subjects. We are all avid readers in our house and it can be difficult to keep track of just how many books the kiddies are reading, making sure they can comprehend the meaning as they become more independent readers. In the past they have written a list either in a notepad or on their own blog, but for some reason they forget to keep logging each book or they find the task too laborious. 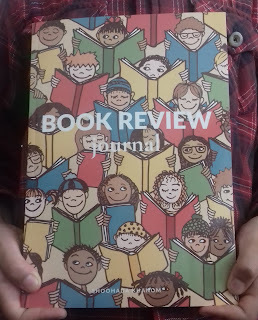 So this week we have been trying out this Book Review Journal by Home Educating mother of six, Shahooda Khanom. DD4 has been showing off her artistic flare this week as she rips coloured paper to shreds!! 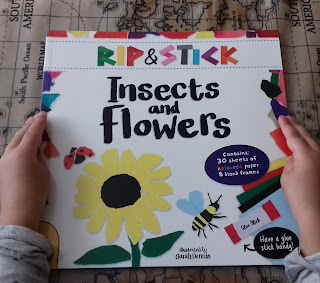 She has been using the exciting activity book, Rip & Stick - Insects and Flowers from B Small Publishing. This book not only offers the creative freedom to tear up the 30 sheets of coloured paper that it contains, but also offers some calm sticking time as she focuses on the simple step-by-step instructions. It also contains 8 blank frames which she can stick her design onto and then pull out to display them on the fridge! DD4 chose to make the sunflower after spotting some in the park the other week. There are other lovely designs to choose from such as a ladybird, fir tree and a bee. 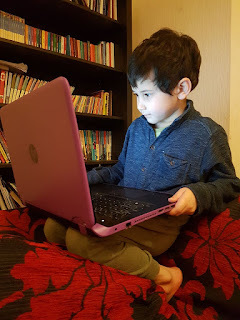 I decided to share ideas and resources, which I think could be of benefit to you, so you don't have to sift through lots of online educational offers, from great fun freebies to educational packages such as EdPlace, an online learning provider which is 100% aligned to the National Curriculum.